Reflect. Recall three positive things that happened today. Tune in to the goodness. 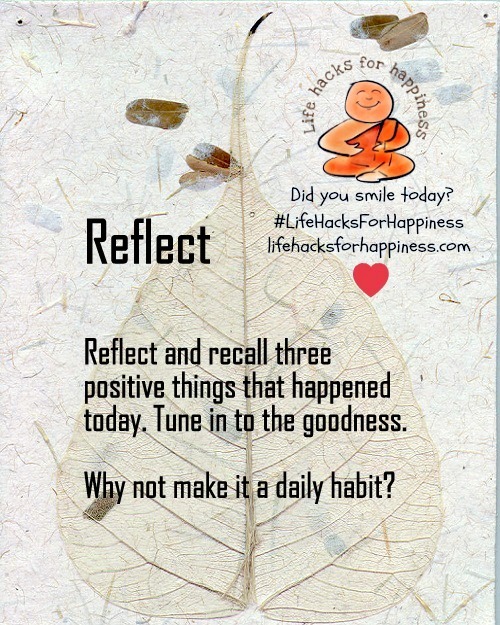 Why not make it a daily habit? 30 days of happiness, when this blog debuted into its first A to Z Challenge this April. Looking forward to many more. Thanks to everyone who visited, commented, shared. Be happy! Linked to A to Z Challenge 2015 Reflections and special thanks to Arlee Bird for an increasingly wonderful experience.